That’s right folks. 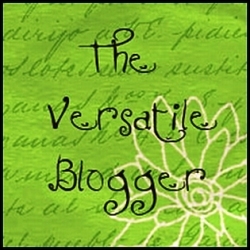 La Avventura has been given the honor of VERSATILE BLOGGER. La Avventura has only been blogging for five months; so it is with great pleasure to receive this award from The Hook – The Book of Terrible. And now it’s my turn to pass the baton to seven glorious bloggers that I have followed in the past five months. In no particular order of importance, the baton goes to. White Girl In Black Face – Have you ever dreamed of being the underdog? Haikugirl’s Japan – Ever wanted to go to Japan but couldn’t? Be an arm-chair traveler through her blog. Very informative. grrrl style. – A 15yr old feminist who is destined to become a music journalist. The CHASE Project – An inspiring woman who lives life to the fullest. And she’s just completed her first marathon. Kudos. Not From Around Here – Follow the adventures of an American living and working in England. JetHead – “The World from 30,000 feet at 500mph”. He’s a pilot, a captain and an English teacher. Get over your fear of flying or planes by reading his blog. Life in Bloom – With a passion to service those less fortunate, this blogger has volunteered in the Gulf Coast after hurricane Katrina as well as in Haiti and Nicaragua. I have taken karate, thai-kick boxing, boxing and jujitsu. I danced lyric jazz professionally for fifteen years. I played soccer with my local soccer club for fifteen years. I broke my tibia playing soccer as I scored the winning goal. My three nieces are my light. Thanks for always including new blogs to check out and read. Have you ever checked out mine? Give it a whirl and let me know what you think. I enjoy reading yours! Well done post! You should be proud of yourself. Pingback: Versatility and, like, stuff. « grrrl style. I am testing out this like thing too!!!! Thanks for introducing it!!! Ohhhhh!!! I like this!!!! I love going to other people’s blogs… but always find that the way it works best is to go to someone’s blog I like, and check out their blogroll or blogs they like!!!! Nifty!!!!! Lots of thanks for this post!!! !